Pigeon is back and he's got activities for you! Pigeon is back and he’s got activities for you! Calling all pigeon fans! It’s time to get busy. Mo Willems, best-selling author and illustrator of Don’t Let the Pigeon Drive the Bus! (and many more titles) has put together over two hundred and fifty pages of drawing, puzzle and craft fun in Don’t Let the Pigeon Finish This Activity Book! Perfect for keeping kids busy indoors during the coming colder months, this huge activity book is crammed with very different and particularly inventive activities, starring of course Pigeon, Duckling and the Bus Driver. This is not your standard ‘colour in the picture’ or ‘complete the dot-to-dot’ activity book. Instead, you’ll get to build a paper airport, complete with luggage carousel; perform a puppet show; and make a sandwich, layer by layer – don’t forget the cheese (there’s two different kinds – Swiss and ‘more cheese’). Willems’ distinct brand of humour finds its way into all of these clever activities. The book is large format and the thick pages are perforated so that kids can tear out their work as they go. There are also pockets inside the cover to keep completed activities. 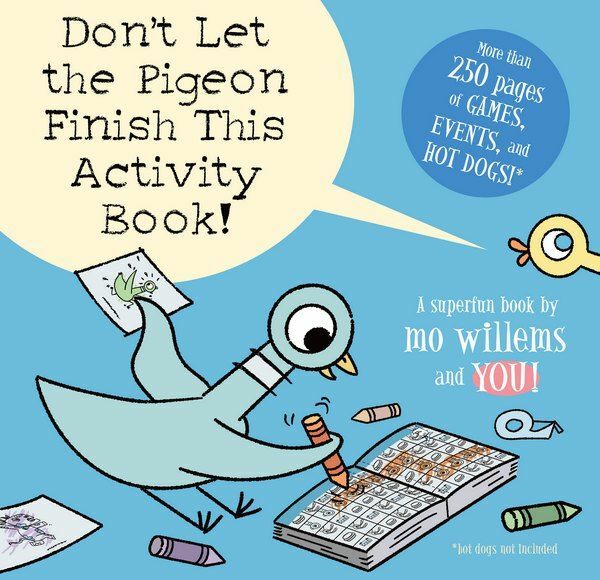 Don’t Let the Pigeon Finish This Activity Book! is suitable for children age four years and over. Find it online at Book Depository, which ships free of charge to Australia. See our previous posts for other books by Mo Willems.